Hey Kids! Lily, one of the Awesome Kids, visits with her friend Chantel, from France, at a children's hospital. Here Lily learns her first lesson in how very sick children can become, but that there is hope as long as they never give up! Please join all the Awesome Kids and Mervin the Mink as they decide on a plan to help those less fortunate than themselves. 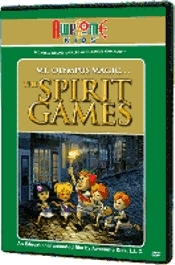 Watch as they compete in their very own "Spirit Games" after learning the reason for the original Grecian games at Olympia. What help could be forthcoming from our fairy and her friend, Zeus? Will their ideas be instrumental in finding a way to help the kids at the children's hospital? Be a part of the fun as Warren, Dillon's goat, turns his DONKEY Cart into a Goatcart and races it in the games. Find out who Blue, Louigi and Fredrico are. Meet Mr. Tu Wheeler, the bicycle shop keeper, Miss Dotty Dots, Miss Carry Carmel, Mr. Peeve, and Mr. Schvensen, the toy shop keeper, and find out what parts they all play as the Kids try to accomplish their goals in a wonderful adventure of competition, cooperation, and heart. Parents! Join the kids in the moving adventure that speaks to good citizenship and heart; the heart of competition, and more importantly, the heart that gives. Watch with delight as the whole Village of Awesome gets behind the Awesome Kids in their efforts to comfort others. This animation is packed with life lessons presented in a way that allows kids to have fun while they learn.